Woe unto you Hassidic Scribes and Pharisees. Now I have proven beyond a shadow of doubt these same Hassidim who are in complete control of Dan Bushkeviks ad-menstruation are in complete control of the Sanhedrin the beast of Revelation Chapter 13 who is raised from the seas of the masses of confusion. These in their own laws say that they are Giborim, which were the offspring of the Nephilim, and they were giants in those days, Mighty men of reknown, and these say they are gods. Now, they invoke the son of perdition which is their false Messiah who will soon come in his own name, and all who dwell upon the earth shall worship him. They call him Moshiach be David and he is in no wise of the House of David whom Jesus holds the keys, for He alone created his house, and David will have no mere man to sit upon the Throne of the House of the LORD the one seed, even the WORD Abraham believed and was counted Righteous by faith, and we who are the seed of Abraham of that one seed Jesus by faith heirs to the Promise. The saints of Jesus the Christ simply are slain the first death and make the transition to Sion, Nope no worries here, for the Kingdom of Our Lord is not of this world but a far away land, even God's Holy mountain in heaven into a company of innumerable angels....Sion where he is the Temple therein forever. This Moshiach is their false king they are about to anoint in the secret chambers. a false suffering servant, a false Messiah, not anointed by the Father, but merely anointed by the Sanhedrin who the Dragon has given their seat and their authority. 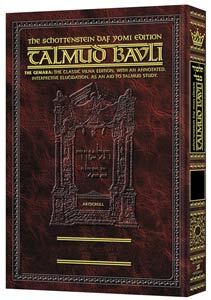 He will understand the dark sentences of Talmud Bavli and Qabalah and sorcery and magik their tradition of Babylon mystery, which make the WORD of GOD of none effect unto them and all who worship their triune shekinah gods beast the Dragon who has given these seventy their seat and their authority. I saw an angel FALL, as fallen angels did in the days of Noe, and he had a key to the abyss. But I tell you, this prophecy is two fold, One for them who believe that Jesus is the ONLY Creator, ONE God the Everlasting Father and the Almighty God, and he alone knows his Father. That Jesus the Christ is OUR God, and only though our God will we understand his Father, whom he is the image of, and in that Image HE Created us in his likeness, not we who created him in our likeness. Them who do not FEAR Jesus the Christ the CREATOR but have watered him down to a second person, but he is no Respecter of persons, a "Replacement Theology of the Pharisaic Scribes and the Hassidic Sanhedrin, fear the Dragon and do not fear the CREATOR Jesus the Christ. Now we who stand Firm do not fear the Dragon But we fear the creator. and not the Dragon, for the Dragon has no inherent power nor Authority. The dragon is only a creation created by the ONLY Creator the WORD from the beginning the same REDEEMER since the foundation of the World the WORD of God Jesus the Christ, who is the IAMHE, God and his Father. The people who dwell upon the earth who are not FIRM Standing that He is the IAM, will ALL worship the beast of the abyss. But them who dwell on the earth who do not fear the Creator......fear the Dragon and his seed and his brood. Now, you must understand, the Dragon is a very real creation and a very real enemy of the Creator. He is cast upon the earth and he is seeking whom he can devour by their fear, and unbelief, for HE knows his time is short. Just before the Sanhedrin anoints their king according to Dark sentences of Zohar, the "aliens" from another planet will come and they will be strange and they will identify this Moshiach as their king, but lo these are not aliens from another planet, they are demons of hell who do not come in the name of the LORD, but they will worship there king, and all who dwell upon the earth whose names are not in the ONLY Lambs Book of life will worship this beast too. we his saints will stand firm for we know that ONLY God the Creator is in complete control and HE alone has sent behemoth and Leviathin and we will not be in fear, for we stand Firm in our testimony that he is the LORD Almighty. The Lord sent us to Give witness and testify of him from the foundation of the world. By this testimony and witness and the Commandments of God we will soon stand in the courtroom against the murderer the robber since the creation and testify for the ONLY LifeGiver and he who is the ONLY Destroyer of the body and the soul our Lord God Jesus the Christ, God and his father. Rv:20:3: And cast him into the bottomless pit, and shut him up, and set a seal upon him, that he should deceive the nations no more, till the thousand years should be fulfilled: and after that he must be loosed a little season. These are the returned neplilim, and they must have vehicles, for they are not Omnipresent now omniscient beings, but are only a creation, even as you are a creation. the END is the END and their is no more. Our Lord God is KING of incorruption of Sion God's Holy mountain in heaven where this corrupted flesh cannot dwell, nor can satan dwell for he is the corrupted adversary of God the Father. The investigation on the June 24, 2005 UFO incident over Xalapa now unveils a new story . A similar UFO sighting took place the same day in San Luis Potosi where several reports from residents told of a strange unusual activity witnessed for several days of unknown groups of flying spheres over the city. One of these sightings was videotaped by Rosario Oviedo at daylight just outside her home for several minutes. According to her testimonial on Friday morning she got shocked seeing the sky filled with luminous objects in an impressive spectacle that frightened her at the beguinning. She moved quickly inside and grabbed her videocamera and could record some minutes of this unusual phenomena. At the same time some neighbors got aware of the sighting by seeing her videotaping the sky and soon the excitement alerted the neighborhood. That same night researcher Jaime Maussan was giving a conference at a local theatre and Rosario Oviedo contacted him giving the video and the report of that morning's sighting. During the conference some persons from the audience confirmed to Jaime the sightings of these strange spheres witnessed two consecutive days since thursday June 23. The next day Saturday June 25 while still in San Luis Jaime Maussan received a report from Pablo Corral Torres about some strange spheres that were seen flying in the sky early that saturday morning over a suburb. not expressed any opinion yet. These sightings from Xalapa and San Luis confirm a new level of UFO activity taking place in Mexico. I will send you a mpg from Rosario Oviedo's video and updates on this investigation. This coming Sunday July 3 Jaime Maussan will present both Xalapa and San Luis sightings on a tv special report. HR 2662 will invite pedophiles, witches, warlocks, Satanists and even 'sinners' to acquire special federal protection from anyone who criticizes them, including pastors. Witches and warlocks in England are, today, lobbying hard for inclusion under Britain's ADL hate law. IAF warplanes and helicopter gun ships struck at at least five Hizbullah positions in south Lebanon Wednesday evening in response to mortar bombardments on IDF outposts in the Mount Dov region. Hizbullah has also extended its firing from the Mount Dov region to IDF positions on the section of Mount Hermon which borders with Lebanon. There were reports of some wounded during the heavy exchanges, although no further details were available at the time. According to reports, IDF troops in the Mount Dov region spotted a terrorist squad from Hizbullah, moving into Israeli territory in the region. Military sources said the IDF troops opened fire at the terrorists, apparently hitting at least one of them. Around the same time, the sources said, Hizbullah opened with a bombardment of mortar rounds on IDF positions in the Mount Dov region. The IDF responded with heavy artillery barrages of suspected Hizbullah positions in south Lebanon followed by the air strike by war planes and helicopter gunships. The extremists Iranian-backed Lebanese Shi'ite organization have carried out similar attacks against IDF positions in the Mount Dov region since the withdrawal of IDF troops from south Lebanon in May 2000. Hizbullah, backed by the Syrians and the former pro-Syrian Lebanese government, claimed that the Shaba farms district in the Mount Dov region was Lebanese territory and therefore Israel did not withdraw from all Lebanese land. The international community, headed by the UN, has rejected Hizbullah's claim, saying that Israel had complied fully with Security Council resolution 425 when it pulled out of Lebanon In May 2000. 15: So the king (Dan Hassidim, Bush) of the north shall come, and cast up a mount, and take the most fenced cities: and the arms of the south shall not withstand, neither his chosen people, neither shall there be any strength to withstand. PM and Chabad Rabbis in a "Very Charged Meeting"
A delegation of Chabad rabbis met with Prime Minister Ariel Sharon in his Jerusalem office yesterday - the first meeting of its kind since he announced his expulsion/withdrawal plan. for these same Hassidim are responsible for all the slayings of the "Lesser brethren"
Jerusalem Post: Under the banner, "Arik Sharon, you are bringing upon us a Holocaust," and with pictures of the Lubavitcher Rebbe everywhere, thousands of demonstrators gathered Thursday night at the Jerusalem International Convention Center to protest the evacuation of settlements in the Gaza Strip and northern Samaria. Rabbi Shalom Dov Kalmanson, a Chabad rabbi from Cincinnati, Ohio, appealed to US President George W. Bush, saying: "G-d appointed a leader to battle against evil, and you launched a war on Afghanistan and won quickly. You moved onto Iraq and won a surprisingly quick victory. But today you're having problems in Iraq. I believe one of the reasons is because of the road map. No man in history has ever forced Jews to battle Jews. It is a horrendous precedent." Bush knows, for the Hassidim Chabad Lubavitch who controls the White House Pimp also controls the sanhedrin, they have counted on the Road map to create the final Chaos to bring their order, Moshiach the son of perdition. Bush gets teary eyes, any time he speaks of "terrorism" for he knows they are forcing him to destroy his own nation, after all he is the "War President', the war unto desolation. Little does he understand he is doublecrossed and will never rule that whore city. Ha'aretz: Thousands of anti-disengagement activists who attended a Jerusalem rally led by prominent rabbis in Jerusalem on Thursday, received a pamphlet accusing Prime Minister Ariel Sharon of bringing a holocaust onto the people of Israel. "Your madness and that of your government will bring a terrible disaster to the nation of Israel, the like of which hasn't been seen in the Holy Land since the days of Titus and Nebuchadnezzar," the leaflet reads. "Don't preach to us about not mentioning the Holocaust ... You are the one who has already brought a holocaust to thousands of dead and wounded in your licentious manner; and you are the one who is currently taking millions of Jews into the borders of Auschwitz," it continued. Under the call, "Who is on the Lord's side? Let him come unto me," which served Moses after the sin of the golden calf [when the members of the tribe of Levi killed thousands of Jews who had worshipped the golden calf idol] and Matityahu the Maccabee against the Greeks, thousands convened in the Israel Convention Center for a symbolic mourning ceremony designed to express their sorrow and pain at the "plan to uproot and deport Jews from the Land of Israel." Noam Livnat, who heads the Defensive Shield anti-pullout campaign, said that if the Israel Police is busy trying to quell stormy anti-disengagement demonstrations throughout the country, it will not have the manpower to implement the pullout. The Defensive Shield campaign has already collected the signatures of some 10,000 soldiers who say they will disobey orders to evacuate settlements. Colonel (res.) Gideon Altschuler called for a collective refusal to follow orders. The master of ceremonies, Noam Arnon, spokesman for the Jewish community in Hebron, [said] "We … are the students of Mordechai, not of Haman, and not of Ahashverosh, the corrupt king." Mordechai the sponsor of Purim ha Goyim of Sanhedrin of the Dragon who gave them their seat and their authority, who now sit upon the seat of Moses, whom they believed not. …Prime Minister Ariel Sharon had instructed police and security forces to take all the necessary measures to prevent road blockages and publlic disturbances by right-wing activists. TEL AVIV - Will the Chabad-Lubavitch movement join the anti-pullout battle? The Hasidic movement is currently embroiled in a biting internal debate regarding the suitable response to the upcoming Gaza Strip and northern West Bank disengagement, Ynet has found. The question of whether the Lubavitchers would enlist in the anti-pullout battle en masse is certainly a cause for concern for security officials, as thousands of determined Lubavitchers could certainly upgrade the resistance to the pullout as it rolls around. In the past decade, the messianic branch of Chabad-Lubavitch has been gaining in strength. The more radical branch has rejected the leadership arrangement adopted by the movement since Gimmel Tamuz, 5754. Chabad’s spiritual leadership, meanwhile, has ruled that the only way to resist the pullout is that outlined by rabbi Schneerson, who in the past said only spiritual protest is allowed, in the form of rallies and prayers. Rabbi Shalom Dov Wolpe from Kiryat Gat, who is among the messianic branch’s top leaders, is expected to lead the active resistance to the pullout and has called on soldiers to refuse evacuation orders. Wolpe is coordinating his moves with rabbi Yekutiel Rapp, who he refers to as “our man in New York”. Rapp is planning to bring a thousand Hasidic Jews to Israel to join the anti-pullout battle. Wolpe says security forces would be unable to stop a thousand Americans at the airport and would have to allow them into the country. “Ariel Sharon is about to be humiliated on live television before millions of viewers across the world,” Wolpe vows. “We’ll gladly go to jail. (IsraelNN.com) MK Avshalom Vilan (Yahad/Meretz) has asked the Justice Minister Tzipi Livni (Likud) to prevent the entry of Chabad-Lubavitch activists to Israel after it was announced that they intend to come en mass to block the implementation of the Disengagement Plan. "We must prevent the entry of these provocateurs to Israeli territory. It is unthinkable that tax payers should fund the imprisonment of these extremists in Israeli prisons from their own pockets," Vilan said. The Coalition for the True and Complete Redemption will hold a nation-wide gathering for Geulah and Moshiach on Gimmel Tamuz. The event will also include a strong protest for Shleimus Haaretz. The event will be held on Sunday, 3 Tamuz, at 7:30 in the evening, in the ampitheatre in Bat Yam. 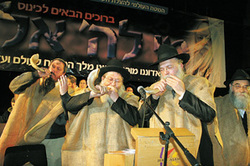 Many rabbanim, community leaders, mashpiim and shluchim are expected to participate. The Chabad Lubavitch who control the White House and the Sanhedrin is sending a loud and clear message to apostate Amaraka that if we allow Sharon to Disengage, there will be more.....more....terror, until by their "protocols" we cry out for mercy, "Give us anything" but this suffering, thus all who dwell on the earth who denied Jesus the ONLY Messiah will worship their beast Moshiach. Make no mistake, George Bush knows full well what is at hand, the "Road Map to Hell"
From the east coast to the west coast, Americans (Talmudic Hassidic Jews) are rallying against the disastrous “disengagement plan to destroy the Jewish homeland in what is known as the Arab/Islamist phase by phase or “stages” plan. If the mission is successful the Arabs will move on to bigger and better projects and targets – America. A mobilization for the movement is reaching a strong momentum to save Gaza and Gush Katif and ultimately Israel, America and Western civilization is gaining at a gangbusters pace. Civil disobedience is breaking out all over the country. A leader in civil obedience from the Holy Jewish Land of Israel will draw a crowd of thousands in Brooklyn. A Manhattan protest that took place on May 23rd was even reported by the mainstream media including such publications as the New York Times, the New York Daily News, Newsday, The New York Sun and The new York Post. The civil disobedience crows drew more than one thousand Chabad Chasidim. These Chassidim are now gathering their strength in their own territory before launching a campaign to finish the job of stopping Prime Minister Ariel Sharon for carrying out his destructive and disastrous “Disengagement Plan” before the terrible tragedy becomes a reality. Thursday evening, 9:30 PM, at 770 Eastern Parkway in Brooklyn – the Shul and offices of the Lubavitcher Rebbes in America – Chabad Lubavitch Chassidim will be gathering to strengthen their campaign against the Disengagement Plan to extract Jewish residents of 25 towns in the Land of Israel, from their legitimate homes, against their will, and hand over the real estate to Arabs. At this massive rally – thousands are expected to attend – the Chassidim will be mobilizing their troops, so to speak, to do all they can to thwart the evil decree called Disengagement. Their main concern at this time is the preservation of Jewish life. The Lubavitcher Rebbe said repeatedly that giving away land would put Jewish lives in danger. Unfortunately his predictions have come true. Military experts agree that the Disengagement Plan will bring a surge of terror in its wake, putting the five million Jews living in the land of Israel in danger. The special guest speaker at the rally will be Member of Knesset (National Unity) Professor Arieh Eldad, MD., Chairman, Ethics Committee; Member, Labor, Social Affairs and Health Committee; Substitute Member, Foreign Affairs and Defense Committee; Member, The Anti-Drug Abuse Committee; Member, The Science and Technology Committee. Cbsnews.com reports about Eldad: Nationalist Israeli parliament member Arieh Eldad set off a storm after calling for mass civil rebellion against the Gaza pullout. Eldad urged tens of thousands of people to confront what he called the "machine of destruction" that will evacuate settlers from their homes. It was one of the most explicit calls yet by an elected politician for Israelis to break the law. Dovish parliamentarians demanded that Eldad be put on trial for incitement to rebellion. Eldad is an esteemed physician who served as chief medical officer in the IDF with a rank of brigadier general. After leaving active military service, Eldad is the director of the plastic surgery unit at Hadassah Ein-Kerem Hosptial in Jerusalem. His endorsement of non-violent civil disobedience brings it out of the realm of ‘right wing extreme fringe elements,’ and into mainstream society and higher. Eldad and his family have moved to Sanur, one of the towns in the Northern Shomron slated for deportation. He is currently establishing field hospitals, something he did for Israel in Uganda. Now he is doing it in the areas that the government wants to seal off. With hospitals on the inside, residents of the endangered areas will not have to leave for medical reasons and risk not being allowed to return. At the rally, Charlie Bernhaut will represent AFSI, Americans For a Safe Israel. AFSI is an organization that is unique in its proud and outspoken advocacy of Judea, Samaria, Gaza and the Golan as integral parts of the Land of Israel and that this claim is established by the Bible, our Eternal Torah. Many Chabad Rabbis and leaders will also make presentations. This is one of the follow up activities to the widely reported rally one month ago which took place in Manhattan, across the street from where Prime Minister Sharon was presenting his lethal plan to members of Jewish organizations. In America’s capital Washington D.C. was another special reception for a noteworthy and respectable voice against disengagement MK Dr. Arieh Eldad. MK Dr. Arieh Eldad, respected Surgeon, Knesset Member and outspoken opponent to Ariel Sharon's disengagement plan, will be raising desperately needed funds for Gush Katif and Northern Shomron. Basic supplies such as food, water and medical equipment must be made available to the tens of thousands that are expected to gather in these communities to prevent the deportation. Dr. Eldad is establishing two field hospitals, one in Neve Dekalim and one in Sa-Nur to treat the expected casualties. The event took place at the Washington Terrace Hotel and was sponsored by Ascendant redemption and Americans for a Safe Israel. On the west coast in Los Angeles, there are two events planned in one week. The first features former Israeli MK Benny Elon who was forced to resign by Prime Minister Ariel Sharon who will speak before a large gathering at Torah Ohr Temple in Beverly Hills, California. Rabbi Zvi Block, of Toras HaShem will be the featured speaker on behalf of Americans for a Safe Israel in another rally and public presentation. A newly published poll shows Israeli support for Prime Minister Ariel Sharon’s Disengagement Plan continuing to fall. According to the poll, which was released Wednesday, support for the plan has dropped to 48 percent of Israeli Jews. A June 17th telephone poll published in Israeli Hebrew-language daily Maariv showed 54 percent of Israel’s Jews supporting the plan. The poll was carried out by the Midgam polling company, affiliated with the Harris Interactive polling company based in the US. It was commissioned by anti-disengagement Likud "loyalists." Despite its having been so commissioned, pollster Mano Geva told Arutz-7 that the poll had been carried out according to the highest accepted professional standards. The poll demonstrated an increasing drop in support for the plan and a steep rise to 41 percent of Israeli Jews who oppose the plan. 11 percent remain undecided. The survey also shows an extremely large percentage of Likud voters and members of the party’s Central Committee oppose the plan, though that comes as no surprise due to the 60% to 40% rejection of the plan following a Likud referendum. Dozens of right-wing activists (hassidim Chabad Lubavitchers) opposed to the disengagement plan were arrested Wednesday afternoon for blocking key junctions across Israel to traffic, as part of a nationwide protest against the planned withdrawal from the Gaza Strip. Israel Police deployed thousands of officers around the country, anticipating massive jams as the activists made good on their pledge to bring the evening rush-hour traffic to a standstill. In a bid to prevent activists from blocking the entrance to Jerusalem, police had barred pedestrians from the area Wednesday afternoon. Despite the massive deployments, demonstrators managed to halt the traffic, and police attempted to disperse them using water cannons. "This is a nonviolent means of protest," said Simcha Shiman, 18, from Jerusalem. "We've used all our legal means of protest, and this is our last legal course of action." Elsewhere in the capital, police arrested four protesters trying to block the road near Mount Herzl, where slain prime minister Yitzhak Rabin is buried. A total of 55 protesters were arrested in the capital. On the Ayalon highway, which encircles Tel Aviv, youths blocked traffic close to the Glilot junction. Police clashed with demonstrators as they repeatedly returned to the road once they had been cleared away. Demonstrators also blocked Geha junction, near Petah Tikva. In the Kfar Sava area, protestors brought traffic to a halt at Morasha junction, where five people were arrested. In southern Israel, some 50 demonstrators gathered at entrance to the Negev town of Sderot, although the road was not blocked. Prime Minister Ariel Sharon had instructed police and security forces to take all the necessary measures to prevent road blockages and publilc disturbances by right-wing activists. In a Wednesday morning rush hour prelude to the planned nationwide protest, anti-disengagement activists threw oil and nails at two points on the the main Tel Aviv-Jerusalem highway, slowing traffic, puncturing the tires of 20 cars, and sparking anger among mainstream opponents of the pullout plan. The far-right National Home (Habayit Haleumi) organization and other right-wing activists plan to block dozens more roads and intersections throughout the country at the evening rush hour Wednesday to protest the disengagement. Police Commissioner Moshe Karadi told the ministers that the police was prepared to face the planned protest. Attorney General Menachem Mazuz said that so far 300 indictments have been filed against protestors who took part in road blockages, and that over 800 were arrested, including 45 who are still being held in prison. Likud legislator Michael Eitan said Wednesday morning that the activists' actions "bordered on an act of terrorism." According to Eitan, "It is a despicable, cowardly act that stains the entire moral struggle of the opponents of disengagement." MK Effi Eitam of the pro-settler Religious Zionism faction, said spreading nails and oil on the highway "plays into the hands of Sharon," undermining the legitimacy of the settlers' struggle. "This crosses a red line," Eitam said. "We are not violent. We are opposed to violence. He who spreads oil and nails on the streets violates a Torah commandment against endangering human life, and this must stop." The Yesha settlers' council, which held a mass roadside protest on Monday, has taken issue with the tactic of blocking highways as counter-productive. But a senior aide to Prime Minister Ariel Sharon Wednesday said the Yesha Council bore responsibility for the activists' actions. "If there is one weak, dangerous, loose link that is guilty of this whole violent struggle, it is the Yesha Council," said Sharon aide Lior Horev. "They are acting like ostriches, looking the other way and taking no responsibility for the people whom they sent to the Gaza Strip, to that bloody hotel, and that girl who kicked the soldier in the head at the beginning of the week today, and today, people who are endangering people's lives." The slowdowns delayed the start of a scheduled meeting of the Knesset Science and Technology Committee by nearly an hour. Officials at Ben-Gurion airport advised departing passengers to leave for the terminal hours early because of feared delays due to road blockages. Shinui MK Ronnie Brizon said he expected the police to act with the same toughness they showed in violent demonstrations in the territories and in Israel. "I want to see fire hoses, I want to smoke grenades. If necessary, I want to see rubber bullets." The protest operation had been planned to start at the 5 P.M. rush hour. Police officials said Wednesday that officers had carried out 'preventative arrests' of suspected activists in recent days, aiming to blunt the protest effort. Police Commander Yaakov Peleg told Army Radio that security forces had uncovered a plan by opponents to also disrupt the supply of water and electricity, and to hit telephone service. arrests, that there is an intention to disrupt and harm infrastructures,"
Peleg told Army Radio. "This is dangerous," he said, adding that the investigation was still in the early stages. National Home hopes that the operation will be as large as its last road-blocking effort, about six weeks ago, when some 40 intersections were blocked and more than 400 demonstrators were arrested. This time as well, the organization is hoping for mass arrests "to further undermine the legitimacy of the government and the disengagement plan," said one organizer. Demonstrators will also distribute orange ribbons and pamphlets to drivers stuck in traffic jams. The police are going on high alert for the operation and hope to apply lessons learned from their previous failure. Thousands of policemen, both uniformed and plainclothes, will be stationed at key intersections, and others will be on alert. Police have also compiled a list of 23 junctions they expect demonstrators to try to block. WEARE, New Hampshire (PRWEB) -- Could a hotel be built on the land owned by Supreme Court Justice David H. Souter? A new ruling by the Supreme Court which was supported by Justice Souter himself itself might allow it. A private developer is seeking to use this very law to build a hotel on Souter's land.